A good news headline about local school bus service is long overdue. Last year at this time, Loudoun County school leaders said they were roughly 160 bus drivers short. They pointed to the shortage as the reason students’ bus rides were longer and that more than 100 routes included double runs, meaning one bus picked up and dropped off kids only to turn around and do a second run before the school day started. That meant some students arrived much too early to school and others arrived late. But Assistant Superintendent of Support Services Kevin Lewis says things are looking up. As Lewis presented his department’s proposed operating budget to the School Board earlier this month, he reported that they are now short by only 13 drivers. With 543 routes, and an average of 38 drivers absent each day, the school system needs 581 drivers. At the time of the report, they had 568. Lewis’ report was a snapshot of one day, Dec. 18, so he noted that the numbers fluctuate, but overall, the driver shortage has practically been solved. The Transportation Department, Superintendent Eric Williams and the School Board tackled the problem from several angles. In the current fiscal year’s budget, which was adopted this time last year, the School Board earmarked money to give drivers’ raises and the opportunity to work more hours. Coupled with a decrease in the cost of what drivers and other part-time employees pay for health insurance, drivers are bringing home more per paycheck. They hired more staff in the Transportation Department charged with improving communication with families and drivers. They also ramped up recruitment efforts by hosting more open house events and starting a referral bonus program. An employee and a new bus driver are both eligible for $500 when the new driver completes the training program and works at least 90 days as a driver. “We’re starting to see the benefits of that program. We do believe that’s something that will pick up as word spreads about it,” Lewis said. 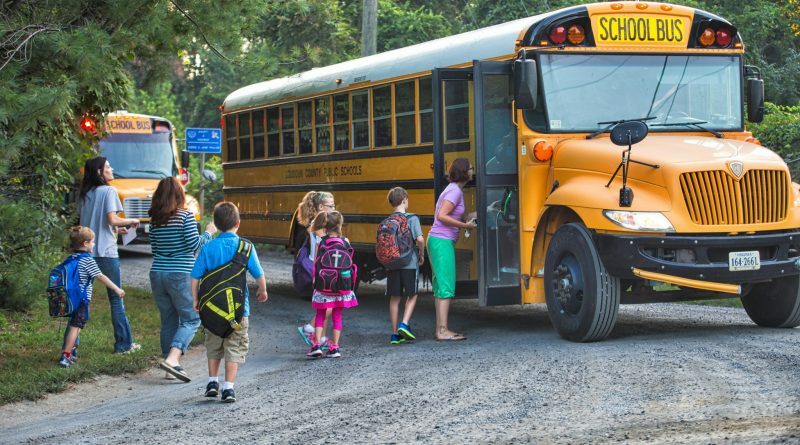 Last spring, the school division also hired consulting firm Edulog Logistics Inc. and implemented a new software system to consolidate bus routes, reduce lengthy rides, and maximize bus space. That cut the number of routes, thus reducing the number of needed drivers. Those changes also triggered a wave of complaints at the start of this school year from parents who said they were not given a heads up that their children would need to walk further to their bus stops. Lewis said Transportation Director Michael Brown has been responsive to concerns and adjusted routes as needed, and the complaints have died down. School Board Chairman Jeff Morse (Dulles) commended Lewis and the Transportation Department staff for their work to improve bus service and recruit and retain drivers. He especially thanked them for reducing the number of double runs, which he said are unpopular with students and teachers, alike. “The teachers have to be there early to handle the first drop off and be there late to handle the second drop off. So when we can eliminate those, I think we’re doing the teachers a service and certainly the students a service,” Morse said. Oh good grief. You think they solved problems associated with the bus system but NO they put them in a cookie jar and since they didn’t do anything there was no feedback, so problem solved. Wish I could pay our bills that way.